The Warm Audio WA-412 provides 4 channels of classic American console preamps in a sleek 1RU design. This style of preamp is often referred to as "the sound of Rock n' Roll" for its BIG punchy low end and smooth open top end. The price/performance ratio of the WA-412 is almost unfathomable to the experienced studio engineer who has possibly paid much more for preamps of this style during their career. 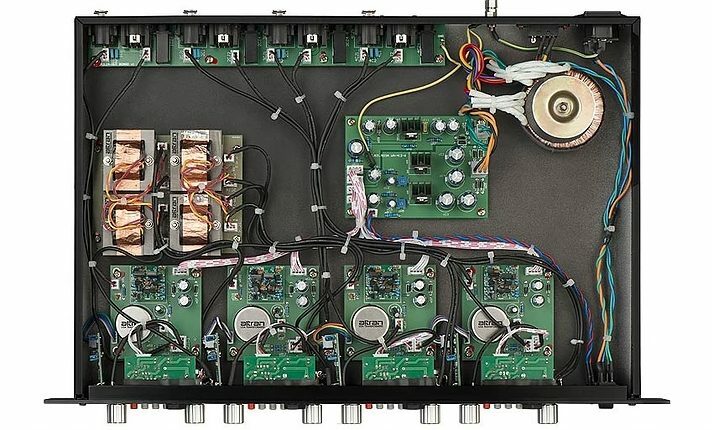 Featuring fully discrete socketed 6-pin op-amps and custom wound Altran USA input and output transformers, the WA-412 leaves nothing to be desired. If you are looking for multiple channels of world-class tone in an affordable package, the WA-412 is the right choice for you. Each channel utilizes a fully discrete socketed 6-pin op-amp that can be swapped with other op-amps. Discrete op-amp circuitry is known for its high headroom and low distortion characteristics and has much to do with the coveted sound of these classic console preamps. Warm Audio proudly uses input and output transformers that are made in the USA by high-end transformer manufacturer, Altran. Warm worked closely with Altran to create unique transformers that extend the low frequency response of the design. The transformers also use a vintage winding technique that produces a very distinct smooth and open character. Carefully choosing the WA-412 components has resulted in an amazing four channel 'workhorse' preamp/DI that performs at the highest levels, while still adding a touch of vintage console magic to your signal. Overall: Not only is the WA-412 built like a tank, It sounds amazingly musical. First I plugged a Bass directly in and engaged the tone button and was amazed! it sounded great immediately. I used it on drums and my drums had a whole new color and punch that was very usable. I have also used it on guitars were i think it impressed me most. The clarity and overall tone is one of the best i have achieved out of my home studio. The output gain stage feature is awesome. I am running it into a Universal Audio apollo 8. It might be the perfect pair!! Style of Music: Death Metal, Grindcore, Crossover Thrash, All kinds of metal and hard rock.